Are you looking for an Ecofriendly HSTP Samford? Keep reading to find out why Samford locals recommend Ecosafe, or contact us here for more information about getting Ecosafe installed at your home. Here’s what the Bowman Family had to say about their experience with Ecosafe. “The previous waste water sewer system had been quite troublesome with regular odour and treated water /spray leaks occurring over many months. Why did you choose Ecosafe? Enquiries to our plumber and further internet interrogation indicated that the Ecosafe system appeared to have good performance reviews over a range of system selection criteria. Judging by reports from social media comments, I am sure the new system will prove to be maintenance and hassle free for my son and daughter-in-law. Tell us about the installation of the new ecofriendly HSTP Samford system. What impressed you most? 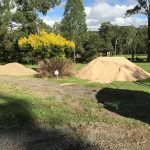 When I arrived on site at 6.50am the Ecosafe team, the equipment supplier/contractor, and plumbers already present, and the clean sand and gravel had been delivered. Having marked out the new tank/filter locations, the tank excavations were soon completed and the concrete tank arrived by 9am and was installed. Damien laid out the extended drain line and attended to the old tank closure requirements. 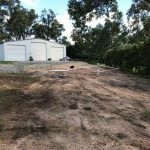 Every effort was also being made to salvage the old control system, submersible pump and all of the spray line, as well as the decorative landscape rocks. Once the old treatment system was decommissioned, by mid-morning the sewer truck arrived to remove effluent and clean out the tank. The new sewer drain line excavation was by then well underway and the power/control wire were being laid out and inserted in conduit ready for installation in the 600mm deep trench. 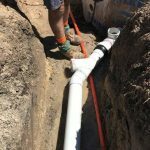 The new drain line and power cables had been installed and pea gravel started to be dumped back into the trench with care taken to properly compact around the pipe and cable. 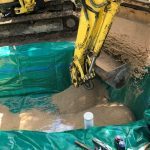 A start was made on the sand filter trench with three of the team working together to assist as required to ensure the coordination of soil excavation, sand filter blanket, then backfill with various layers of pea gravel, clean sand, geotextile and filter distribution piping. The filter was nearing completion so that the spray line trench and spray circle system was then initiated. 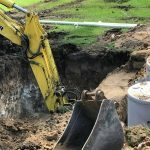 Meanwhile, the plumbers had been completing the piping connections, filling the tank, individually testing the household service connections and compacting/managing the trench and tank connection and cables. 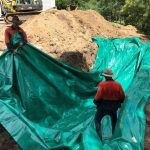 We had also asked Damien to install a large coarse rock/filter/geotextile for storm water to deflect seepage both away from the sand filter as well the adjoining neighbours yard. Once all of the major works were complete, the equipment operators Andy/Steve went to work to deliver a quality finish to the site landscape, removing gravel and coarse rock from lawn areas to the driveway, deflecting surface water around the sand filter zone and spreading some crushed road base to finish up the damaged driveway surface. Despite being an extremely long and strenuous day for these guys finishing after 5pm. It was very impressive to see that everyone worked well as a team from start to finish, only catching a drink or a sandwich on the fly. Not only does Ecosafe only use quality parts and materials, but we’re enormously proud of our team and the quality workmanship they provide on every job – as evidenced by the detailed feedback from this happy Samford customer! 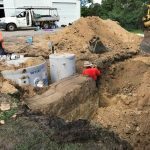 Time to upgrade your old septic system for an ecofriendly HTSP in Samford? 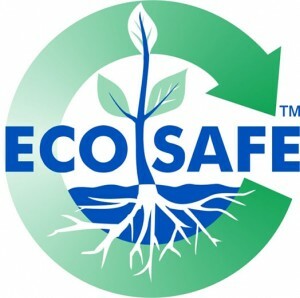 Call Ecosafe today for a no obligation site visit and quote. Ecosafe is Australia’s leading environmentally-friendly, low maintenance and cost effective wastewater systems available on the market. Manufactured from only the highest quality parts and materials and installed by Ecosafe’s qualified and personable team, our unique 3 part wastewater system comes with a an impressive 15 Year Guarantee. 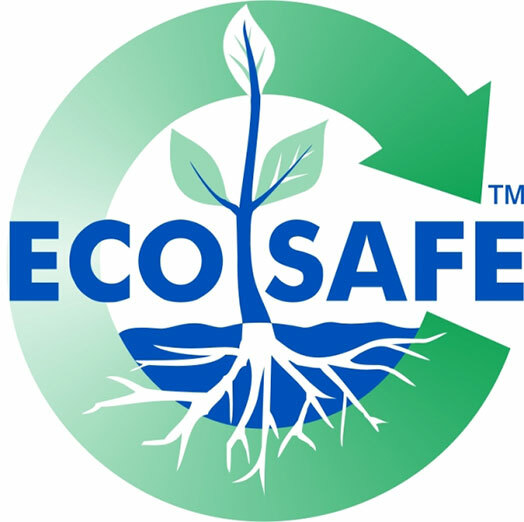 Regardless of whether you’re building a new property, or need to upgrade an existing septic, wastewater system or HSTP, Ecosafe can help! Submit an online enquiry here or call us on 07 3103 9069. Click for our latest news and blogs, find our what other clients have said about Ecosafe, or learn how the Ecosafe System works here.